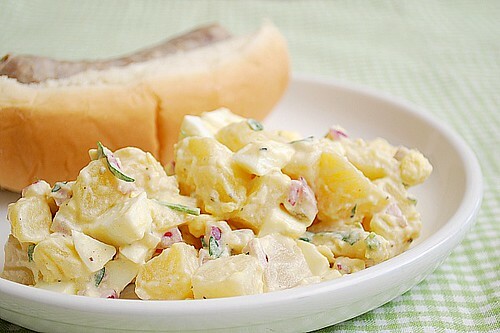 I've been craving a good potato salad since the summer started. That seemed to be the only dish missing from our recent cookouts and with every gathering we had around the grill, my craving grew. But thankfully my craving has been thoroughly satisfied with the best classic potato salad I've ever had (so far.) The original recipe called for russet potatoes, which I substituted with Yukon Gold potatoes instead. I thought they gave the salad a nice buttery flavor and additional color with the pretty golden hue. The key to this recipe is allowing the potatoes to cool with a little red wine vinegar. Doing so allows the potatoes to absorb the tangy flavors of the vinegar that carries well with the dressing. As for the dressing, it's a straightforward mixture of mayonnaise, sweet pickle relish, red onion, Dijon mustard, a few spices, fresh parsley with chopped hard boiled egg thrown in. Delish! When the IP beeps after pressure cooking for 4 minutes, allow your IP to naturally release pressure for 5 minutes. While naturally releasing pressure (also known as NPR or NR), the display will reflect numbers counting up from 1. The numbers indicate how many minutes the IP has stopped cooking since it beeped (or how many minutes it has been naturally releasing pressure). No need to touch your IP while it naturally releases pressure. When the display reflects L4:00 (which is 4 minutes since the IP has beeped), turn the setting on top of your IP to VENTING. Doing so allows the IP to quickly release any remaining pressure (also known as QPR or QR). I use a wooden spoon to carefully turn the setting to avoid close contact with the potential steam. You may also want to turn your IP away from cabinets to allow the released steam to escape freely. The pin at the top of your IP will drop when all pressure has been released and it's safe to open. Remove eggs; peel and chop then set aside. Remove potatoes from IP and drain excess water; transfer to large bowl. Add vinegar to potatoes and toss gently to combine. Let stand until potatoes are just barely warm or almost fully cooled, about 20 minutes.